Surrounded by pristine beaches and lush rainforest, Narooma is the perfect holiday destination. 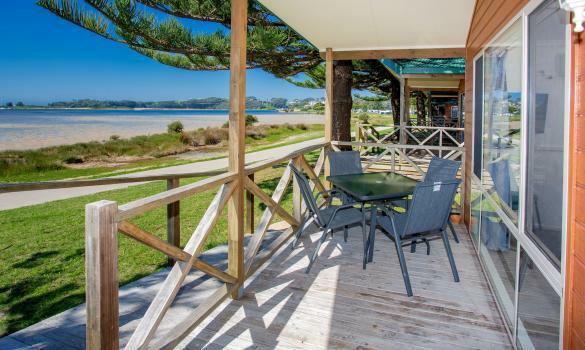 BIG4 Narooma Easts Holiday Park is ideally positioned on the banks of the stunning Wagonga Inlet where the turquoise waters are full of fish and other marine life. Enjoy the spectacle of nature at its best. We are widely recognised as the first choice of Narooma family friendly accommodation with an extensive range of high quality cabins, caravan and camping sites. Choose from luxury spa units, to waterfront bungalows, to classic waterfront tent sites. See which style of accommodation or type of site suits you, your family, or a group of friends looking for a memorable holiday on the south coast of NSW. BIG4 Narooma Easts Holiday Park has everything you need at your fingertips including beautiful BBQ areas, shopping, and fun activities for children. During your Narooma holiday take advantage of the pristine waters and beautiful countryside and discover why it's so attractive to travellers from all over the world. Big4 Narooma Easts Holiday Park is the perfect base for travelling families. Take advantage of our BBQ Areas, Swimming Pool and Jumping Pillow or head out and go surfing or swimming at the Narooma beaches. There's also Montague Island to see, shops adjacent to the park to explore, or just enjoy the serenity of the Wagonga Inlet. Find out what events are on during your next Narooma holiday. From whale watching to kayaking to hitting a hole in one at the local golf course. Psst....are you listening? We'd like to tempt you with a special offer or two. Don't just take our word for it. Read what other guests have to say about their recent visit.